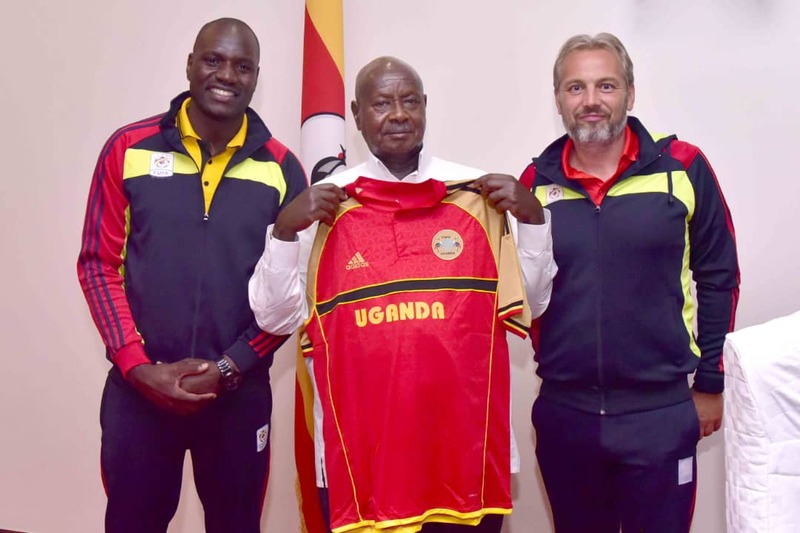 ENTEBBE – As part of celebrating the 56th Independence, HE the President of Uganda, Yoweri Kaguta Museveni hosted the National football team-Cranes at his residence, State House-Entebbe on Tuesday evening. This comes less than a week before the Cranes host Lesotho in their third Group L AFCON 2019 qualifiers at Mandela National Stadium in Namboole. In a jovial mood, the President discussed football matters with the contingent before he announced his offer of a chartered flight to fly the Cranes to Maseru for the reverse fixture against Lesotho to be played next Tuesday 16th October 2018. President Museveni also offered the Uganda Cranes contingent a financial boost of UGX 200M (Two Hundred Million Shillings) to help them in their preparations. This is not the first time the president is extending such support to the Cranes after doing likewise in 2015 as the team prepared to take on Togo in a double header for the 2018 World Cup qualifiers. At the event on Tuesday, President Museveni congratulated the team for posting results that have kept the Cranes on top of the group in the campaign but urged them to work harder against Lesotho on Saturday. “I have been following you of recent and I thank you for the performance but we need to work harder for better results, said the President. “I have offered you a chartered plane to Lesotho and UGX 200M to help you get good results. Speaking on behalf of the players, team captain Denis Onyango appreciated the President and the First Lady Janet Museveni (Minister of Education and Sports) for the recent support towards the Cranes and football. The Uganda Cranes Technical team led by head coach Sebastien Desabre was also in attendance. The delegation to State House was led by FUFA 1st VP Justus Mugisha, accompanied by 2nd Vice President Darius Mugoye, FUFA CEO Edgar Watson and the FUFA Finance Director Decolas Kiiza. Mugisha noted the fact that support from the President and Ministry of Education and Sports is one of the reasons football has been picking good results. “The support from the President is a sign that he follows and loves sports, said Mugisha. “Football has been picking good results partly because of such support from the fountain of honour and office of Education and Sports. “This offer will help the team fly in time to Maseru for the game. The Cranes lead Group L with four points from two games having defeated Cape Verde 1-0 and then drawing 0-0 with Tanzania. For Lesotho, they are second on the log with two points from as many games. The other Group L fixture will see Cape Verde host Tanzania on Friday before both sides lock horns again on Tuesday in Dar es Salaam.